Hide and seek is a fun game to play with your dog – but it’s also much more than that. It’s a very special bonding experience. It teaches your dog that staying close to you is rewarding. You’ll love watching your dog look for you from your hiding spots. It’s amazing how quickly they learn the game, and begin to search in areas you’ve hidden before. At first, you’ll need to teach your dog to stay in a spot that obscures their view of you so you can hide. It’s tough, because most dogs will get up the moment you leave their view. You’ll need to set your dog up for success by asking them to “wait” or “stay” for just a few seconds while you’re visible, then work your way up. Some people say “stay” when they want their dog to wait until they return, and “wait” when they want the dog to wait until they are called, as you do in hide-and-seek. I’m a little sloppy about that, saying “wait” and “stay” interchangeably. Regardless of what word you use, be sure to hold your palm out like a crossing guard. Dogs are great at reading hand signs, and the universal sign for “stop” could come in handy in an emergency situation. If your dog starts looking for you before you call them, simply lead them back to their waiting spot and try again, cutting back on the wait time. Once you’re hidden, call your dog’s name, say “come!” or whistle. When your dog finds you, be sure to make a huge deal out of it. You can play hide and seek with or without treats, but I like to use food at first, then only occasionally. During a particularly difficult seek, when your dog is walking right past you and pacing around, looking in all of your usual hiding spots, they’ll be especially excited to finally find you. That’s a time for big YAYS! Hide and seek is one of the first games I ever played with baby Matilda. It’s how I taught her to stay and to recall like a speeding bullet. 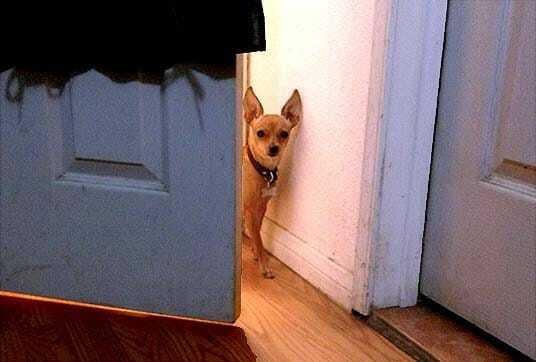 When your dog loves hide and seek, they’ll naturally start to look for you when you’re not around. In emergency situations, when Matilda got loose, she’d keep running if I chased after her. But when I walked slowly and kept myself hidden, it didn’t take long for her to appear to think, “Where’s mom?” and come running back into my arms. I also helped Matilda get comfortable with her travel carrier by having her stay inside while I hid. Being inside her bag became very rewarding, so it was much easier to fly with her in-cabin. Is Your Dog Smarter Than A 2 Year Old? My dogs’ excitement when they find me, whether I have treats or not, reminds me of the thrill babies express when they play peek-a-boo. Human children do not develop object permanence until they are 2 years old. If you hide a cookie under a cup, the baby basically forgets that it exists, and is surprised when it appears again. Dogs have been shown in studies to have object permanence. While comparing two species is like apples and oranges, this is just one reason why researchers say dogs have abilities comparable to young children. Knowing this, it’s even more heartbreaking for me to think back on times I’ve seen dogs chained up and left alone in yards. The isolation, and constant stress of watching strangers walk back and forth all day – it’s cruel. Can A Dog Be A Hider? I have not yet tried to teach my dogs about the “hiding” role in hide-and-seek. Even if it seemed possible to get them to understand the concept, I’ll never try. I’ve heard of some dogs being good at hiding when it’s time for a bath or medicine. My dogs haven’t considered the possibility of hiding from me, and it’s probably best this way. Hide and seek provides the physical and mental stimulation your dog needs to stay happy and out of mischief. It’s fun to play outdoors to strengthen recall in different areas. But when it’s too cold, you can break out some pillows and blankets to create endless hiding spots inside your home. Creative play is a big part of positive training. Get some more ideas for indoor winter activities from my friends’ blogs in the Positive Pet Training Blog Hop! Will A Micro Prong Collar Stop Your Toy Dog From Pulling? Who's The Alpha Dog In Your Multi-Dog House? Mr. N has never considered hiding from me either… except when it’s time for me to leave and he always goes to the same place. I tried playing hide and seek with Mr. N in a field once and he flipped out when he couldn’t find me and started running in the direction of home. Ooops. Thanks for joining the hop! Aww, Mr. N is such a clever little munchkin. Thanks for hosting! I love playing hide-n-seek with my 3. Charley, Zè and Lexi love it too – I think mostly because I give myself away by giggling. I guess I’m pretty bad at the game! I’ve not tried the more formal start to the game you described in your post. I usually start by hiding and then calling them while they’re messing around outside. I recently added the Marco Polo call when I notice they’re struggling. It’s important for me that they succeed every time so I help out a little when necessary. It keeps them coming back for more! Sometimes my hubby will encourage them by asking “where’s mommy”, that get’s them really excited. Thanks for this great post. I’m going to include the extra step of ‘waiting’ and see how quickly they get it. Haha, that must be a ton of fun with your German Shepherds! It’s hard not to laugh when they can’t find you, I’ve given myself away like that too! Happy hide-and-seeking! Hide and seek is a great way to train dogs. It’s a fun way of giving them exercise and stimulation. Plus it reduces stress for both the dog and the owner. Thanks for sharing some simple tips on how to teach dogs to play hide and seek. Thanks Leigh! It’s a ton of fun. Haha, I guess it works a little better when your dogs are terrible at tracking. I think their noses are broken, they will walk right past me multiple times. This is a terrific article! Hide & Seek is a staple in my dog training programs. It’s one of the best ways to make recall training fun for individual dog parents or the whole family. Game-based dog training methodology like Hide & Seek is one of the best ways to train behaviors because it’s been proven that dogs learn faster when they are having fun, and having fun with a dog is the best way to build a lasting, trusting bond with them! Hahaha what a fun way to get exercise for both you and the pup! I kind of just end up chasing my dog around the house and she loves it! She usually taunts me by holding a toy in her mouth, believing I want her toy as much as she does! I definitely should try and teach this to her as well haha! Thanks for the information! James recently posted…Why Do Cats Groom So Much? Hi! Such a great article, I will be sure to try this when I get home with my dog! At the moment we play a game called chase pog. I say the word chase pog to my dog Ella and she runs and picks up a toy in her mouth. I then run behind her while she repeatedly does the circuit of the kitchen and the living room.